First published in 2004, The Jewish Study Bible is a landmark, one-volume resource tailored especially for the needs of students of the Hebrew Bible. It has won acclaim from readers in all religious traditions. The Jewish Study Bible combines the entire Hebrew Bible-in the celebrated Jewish Publication Society TANAKH Translation-with explanatory notes, introductory materials, and essays by leading biblical scholars on virtually every aspect of the text, the world in which it was written, its interpretation, and its role in Jewish life. The quality of scholarship, easy-to-navigate format, and vibrant supplementary features bring the ancient text to life. 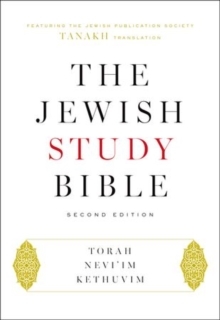 This second edition includes revised annotations for nearly the entire Bible, as well as forty new and updated essays on many of the issues in Jewish interpretation, Jewish worship in the biblical and post-biblical periods, and the growing influence of the Hebrew Bible in the ancient world. The Jewish Study Bible, Second Edition, is an essential resource for anyone interested in the Hebrew Bible. Pages: 2400 pages, Full-color map section; 24 b&w illus.